As I checked my e-mail, I couldn’t believe it. 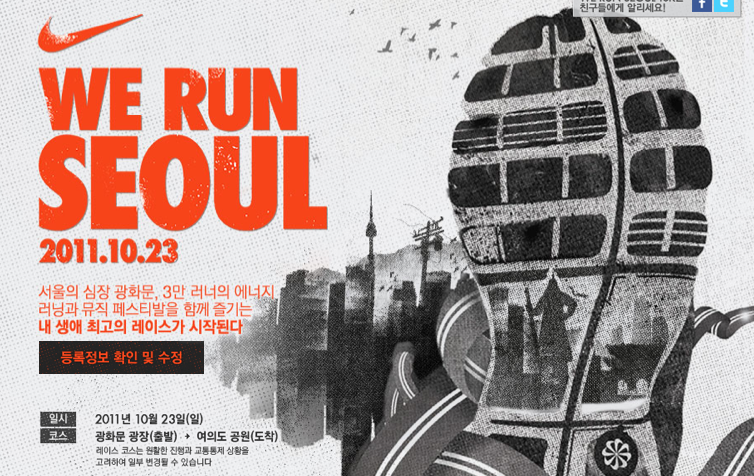 I received a confirmation that I would be able to participate in the Nike We Run Seoul 10K race happening on October 23rd, with 30,000 other people! This was another one of those last minute impulse kind of decisions that I didn’t really fully think through. My friend Choua had posted on her facebook about the race the other week, and I thought that I should sign up. A long time ago, I told myself that I would try to run in a full marathon by age 30. Well, years later, as my body is getting older and I’m feeing it more and more, I’m in no shape to run a marathon. Honestly speaking I was never a long distance runner. I hated having to run the mile during P.E. class when I was younger. I always enjoyed playing sports like soccer and volleyball, but having to just run was pretty close to torture for me. My friend Janice and I decided to sign up and we started training on Sunday morning. Yes, we went to our school fitness center at 9:30am to run! We started out running 5K. Today, after we both found out we are in the race, and had our second training run. We might even try to go to school early around 6am to run as well (in case anyone else wants to join)! As I was running today, there were many times that I wanted to really give up and stop, but it was nice having other people running with me. It helped me to keep going even though every part of my body was telling me to please stop. I’m excited to share with my students about this too. I can already see some potential analogies I could use my training for this race as connections for my mini-lessons in reading workshop! Creating quarterly reading goals- Creating a goal to run 10 K, and working my way up to meet that goal. Reading with fluency & stamina- When I run, I need to run at a good pace, not too slowly or not too quickly. Developing strong reading partnerships- It’s much more fun and motivating to run when you have a partner. The Help, Hong Kong & Reading Partners! This past summer, when I was at the Teacher’s College Reading Institute, I kept hearing about this book called The Help. A few weeks ago, I finally borrowed the book from my friend and started reading it. I didn’t really know what the book was about, but once I started reading it, I couldn’t put it down. I was drawn into the world of Skeeter, Minny & Aibileen. I was so curious to find out what would happen to them as they started this incredibly journey of writing their story. As a writing teacher, I was drawn into this story because these women were developing a voice, power and freedom by sharing their stories. I loved how Aibileen wrote her stories herself and even her prayers. I loved that she found her voice through her writing. It made me think about my students, and how I want them to find their voice through their writing. I want them to see that their writing can have power, it can influence others and can be a valuable tool for the rest of their lives. 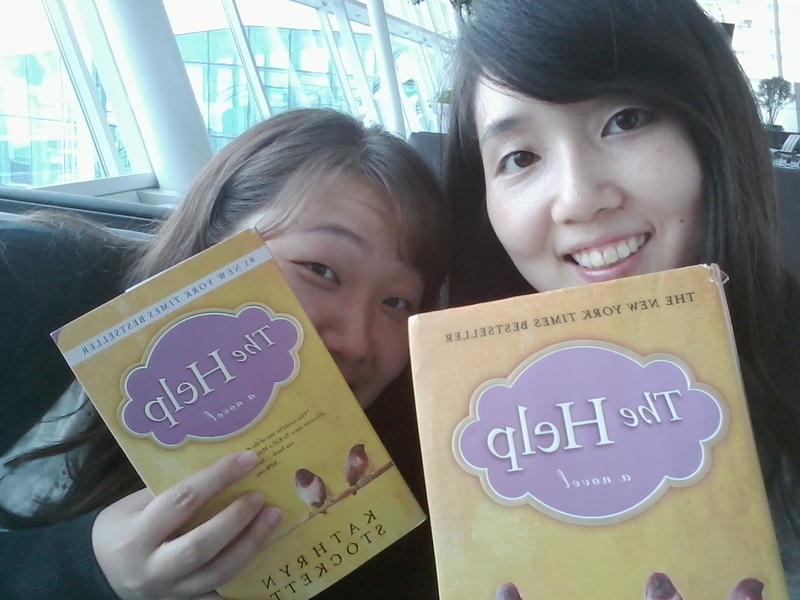 Well, the other day, I got onto my flight for Hong Kong with my friend and coworker, who happened to be reading The Help! We both brought the book with us on our trip. We had become unexpected reading partners. It was pretty exciting because now I could talk to her about the book. Also, I started to think about how I would share with my students that even adults can have reading partners. One of the important nuggets I gained from the Teacher’s College Reading Institute was that we need to be “mentor” readers for our students. What are some ways you are a “mentor” reader for your students? Did anyone else read The Help? What was your favorite part?